View More In Pressure Cooker Parts & Accessories. The authentic Instant Pot sealing ring is an integral part of the Instant Pot safety mechanism. It’s designed, engineered, and built with the optimal material to achieve the hardness and strength required to withstand high-pressure force during electric pressure-cooking. 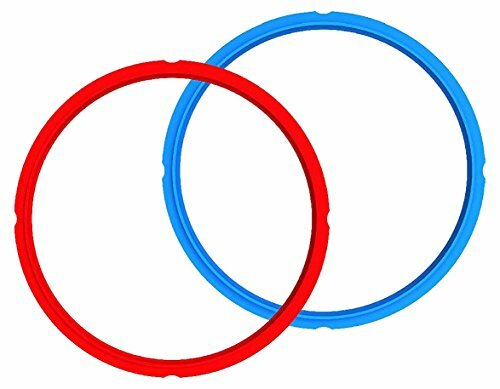 Instant Pot sealing rings have passed UL, FDA, and LFGB tests for safety, including food safety. To ensure your Instant Pot cooker continues to perform as it was meant to only use Instant Pot authentic sealing rings with your Instant Pot cooker. It is recommended to replace your Instant Pot sealing ring every 12-18 months. To avoid discoloration and odors, one may wish to change the sealing ring every 6-12 months. This 2-pack color set, allows you to use one for sweet and dairy, and the other for savory foods. Note: The use of third party unapproved sealing rings may cause damage, safety risk and void the Instant Pot warranty.